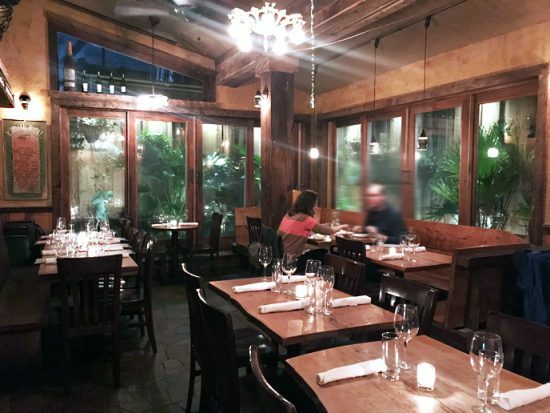 Warm and inviting, the doors of Kashkaval Garden open to a narrow, caramel-colored dining room with wood paneling and an exposed brick wall. The handsome front dining room leads to a rustic bar, fully equipped with beer taps, casks, elixirs/mixers and various jars filled with colorful and fresh garnish. Beyond that is the garden room (above) with earth-tone, slate flooring, more wood than a petite ski chalet and bottles of fine wine scaling the rear wall in proper storage. A single and brilliant chandelier and skylight windows bring the room’s décor to life. Kashkaval Garden opened their doors in 2004 and has a steady stream of happy diners in-the-know as well as visitors who happen to stumble across the obscure wooden door that looks like something out of a J. R.R. Tolkien book. 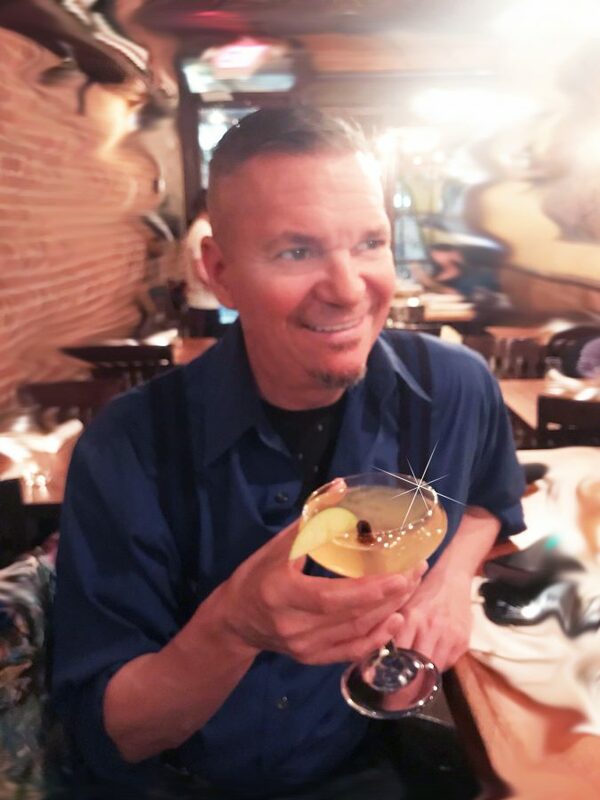 I recently visited the eatery and discovered their new menu for this fall and winter. The seasonal cocktail menu is extensive with concoctions from The Smokey Negroni (Mescal, Campari and Sweet Vermouth) and Rosemary Ginger Margarita (Silver Tequila, Rosemary-Ginger and Lime) to L’Abricot Old Fashioned (Bourbon, Apricot and Bitters). 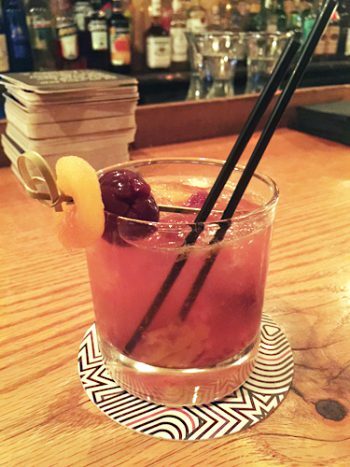 The apricot and cherry garnish take the Classic Old Fashioned to another level. The Hudson Valley Lightening cocktail made with Cornelius Applejack, Bourbon, Cinnamon and Snowdrift Cider warms the soul – the cinnamon stick and apple slice make the cocktail pungent, tart and semi -sweet. The end result is like sipping on apple pie but with a strong kick in the core. Delicious! The house wine list is complete with a selection that would make Bacchus raise a glass and take a bow. For starters, the Kashkaval Appetizers include Baked Rosemary-Honey Feta or Grilled Halloumi Cheese Sticks and Peppadews — spicy and sweet peppers, stuffed with feta, mint, goat cheese and basil. They also offer various tapas including Dips that come with warm pita bread (above). This assortment includes your choice of 1 to 6 salads/spreads like tabulie, hummus, red beets, etc. Depending on the size of your group, they make for a delicious platter to share. 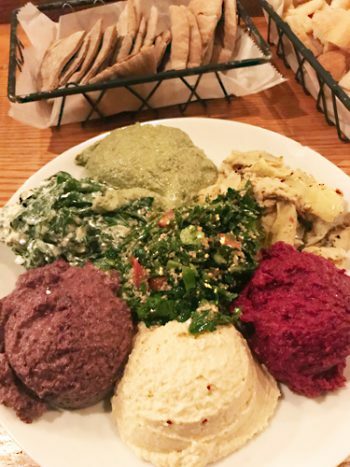 The Dips are traditional and fresh with generous portions to share even with the pickiest eater. 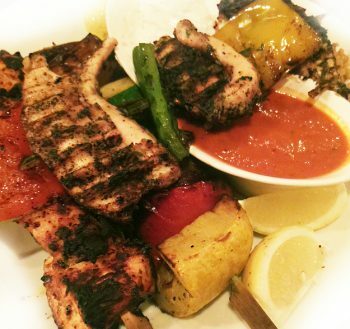 Their Skewers are tasty and grilled to perfection (above). They include tender Chicken marinated in yogurt with herbs and spices. The Chicken Adana is a spicy option made with mint, oregano and sun-dried tomato. Vegetarians indulge in the Garden Skewer prepared with seasonal market vegetables, oregano and balsamic vinegar. Kashkaval Garden also offers a Filet Mignon Skewer with rosemary and garlic. Kashkaval is the word for a specific cheese and made for a dish that the Swiss have conquered as Fondue. This yellow brand of dairy culture has regained its popularity with ‘foodies’ and fans of The Food Network. In Italian, the word for kashkaval is caciocavallo: It’s made with cow’s milk and a long standing tradition for Turks, Kurds, Romanians, Serbs, Italians, as well as other cultures. 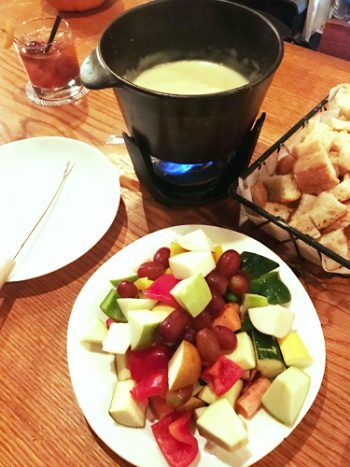 Skinny fondue forks and thumbs up, the menu selections of Fondue make Kashkaval Garden an exceptional place when you are craving a warm, gooey and savory pot of melted comfort. They offer several options with Bunsen burner caldrons (fondue pots) for sharing. Depending on your choice, ingredients range from Bulgarian Kashkaval cheese, sheep’s milk cheese, Gruyére with truffle & oil to mouth-watering Raciette. In one word: Yum! 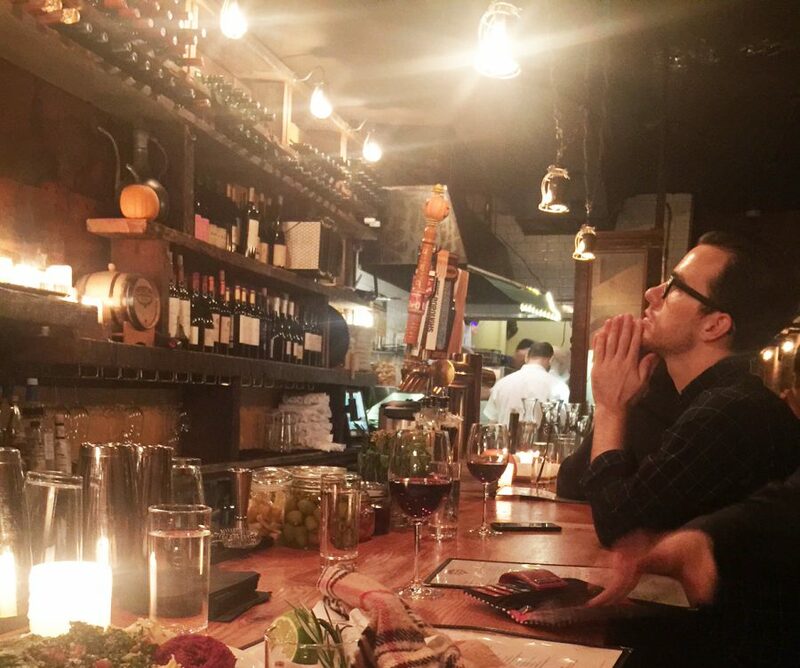 When looking for a restaurant after a day of shopping; a place for your friends and co-workers to gather or something decadent on a casual date night, follow the aroma of Mediterranean-style cuisine to the wooden door on 9th Avenue. Note: They offer a popular weekend brunch, daily Happy Hour and space for group dining. Read City Pulse every month for the latest that is happening in and round New York City. Check out P.K. Greenfield’s recent review of Council Oak Fish at The Hard Rock Hotel and Casino in our Travel Section.